Thorn is a lively and very funny magician who's been performing his comedy magic all over the country to all kinds of audiences for many years. You may recognise him from his several appearances on TV. But mostly he's found performing and amazing audiences at private parties large and small, dinners, corporate events, weddings, office parties, media events and just about every type of party you can imagine, from venues as small as farmyard barns and village halls all the way up to a party inside the Houses of Parliament! Now that was a weird gig! Thorn is a very sought after Magician, travelling to events and parties of all sizes all over England, Wales and Scotland and as far flung even as Dubai, the USA, South Africa and all over Europe. 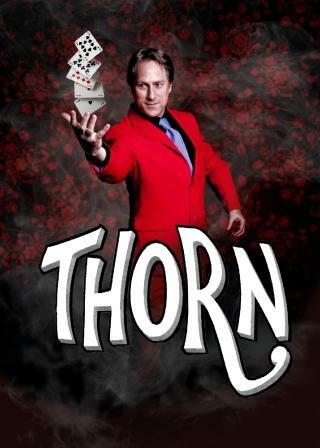 Thorn is not a dull magician! He's friendly, lively and very funny. 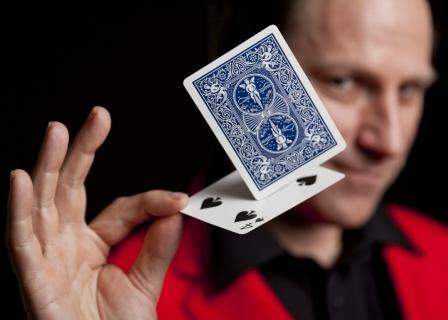 Despite his impressive skills as a magician he doesn't take himself too seriously and his audiences feel relaxed, amazed and entertained as he interacts with them personally, creating magic and miracles at their tables or in their very hands. Mind blowing tricks with cards, coins and other household items happen right under their noses. Linking together a couple of Polo mints? Yep, Thorn does that and so much more! So if you've a wedding in Wales, a business event in Birmingham or a lunch in London, book Thorn and let him cast his magic spell over your friends, guests and clients. With over 20 years experience travelling the world as a full time magician and comedy entertainer Thorn now presents his brand new fast-moving and hilariously funny magic cabaret show, ideal for holiday parks, cruise ships and evening cabarets. Swords, balloons, blindfolds, playing cards, magic wands, things changing, appearing, disappearing into thin air, mind reading effects plus sight gags, visual jokes and Thorn's own infectious humour will keep the audience enthralled throughout. Thorn has different versions of his show for family audiences or senior cruise audiences and can perform any length of show from an 8 minute spot to full shows of 45 minutes. Past clients include Haven, Butlins, Brittany Ferries, Cosmos Holidays, Club Med, Chessington World of Adventures, plus corporate events for Microsoft, Virgin Atlantic and British Airways.